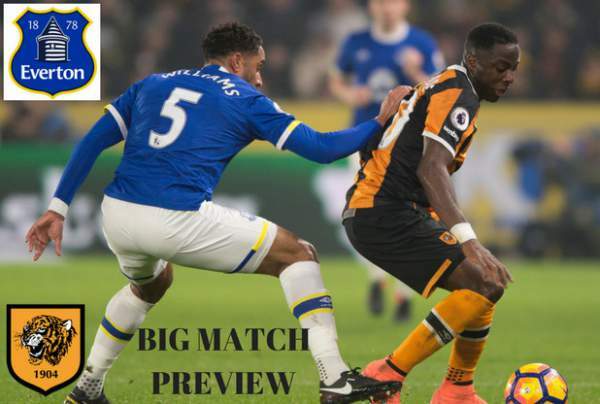 Everton vs Hull City Live Streaming EPL Score HUL v WAT: Everton takes on the struggling HullCity on the 29th match day of the Premier League at the Goodison Park. Everton is currently seventh on the table with 47 points from 28 matches, two points below Manchester United and seven points above West Bromwich Albion. Currently, Hull C in the relegation zone as they are 18th in the table with 24 points from 28 games, one point below Crystal Palace and two points above Middlesbrough. Everton is pushing into the top five as they are just three points below Arsenal who are fifth on the table, but they have played two more games than Manchester United and Arsenal. They have won 13 games, drewing eight and losing seven games in total. Watch: Stoke City vs Chelsea Live Stream. They have scored 47 goals and conceded 30 goals in total. Leighton Baines should be available as he has recovered from his back problem. They have lost just one home game from their last 17 games, losing to Liverpool in December. They could win six home games in a row for the first time since April. HCity last won at Everton was way back in 1952 when they played in the second tier of English football. Hull City are struggling to maintain their position in the premier league as they are currently in the relegation zone and needs to win or draw in this game to come level with the 17th placed Crystal Palace. They are unbeaten against Everton in their last three games, winning one and drawing the other two. H City is currently winless in their last 13 premier league away games, drawing two and losing 11 in total. They have conceded a league-high 69% of their goals in the second half of the matches. They have won two games, drew one and lost two in their last five games in the league. Robles, Jagielka, Coleman, Williams, Baines, Davies, Barkley, Schniederlin, Mirallas, Barry, Lukaku. Jakupovic, Maguire, Robertson, Ranocchia, Omar, Grosicki, Clucas, Markovic, Huddlestone, N’Diaye, Hernandez. Everton would be looking for a win here as they are playing at home.